The Lower Antelope Canyon has become one of the favorite attractions for tourists and photographers around the world. The Navajo name for "Hasdeztwazi" (meaning "spiral rock" arch shaped), and years ago, the formation of the pronghorn antelope freely wandering in and out of the canyon has created its English name. This incredible gorge is eroded by nature's ten thousand years of geomancy, sanding the local sandstone into different shapes, textures, and structures, become what we see today. Solar clouds continue to change, scatter light from different angles and colors into the stone walls of antelope canyon, through the reflection of a canyon rock, formed a dazzling color, light and shade. Due to the strict restrictions of Antelope Canyon, you MUST CHECK IN at least ONE HOUR earlier before your tour start. Please note that if you are LATE, your ticket will be voided and it is not refundable. You'll bear the consequences if you arrive late. 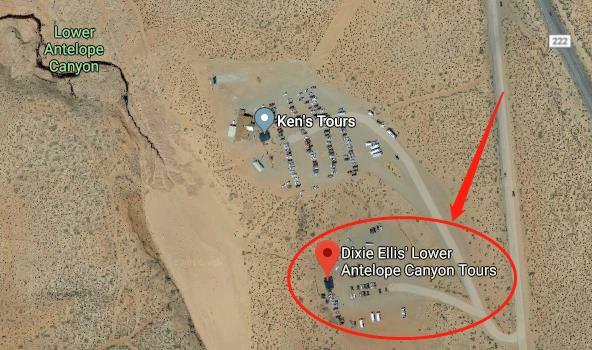 Need to take attachment【PDF voucher】 and valid ID arrive at least 1 hour to 【Dixie Ellis’ Lower Antelope Canyon】 check in. Please check-in at least 1 hour before the tour due to high volume of tours. There will be no refund if a customer is late or misses the bus. An adult can only lead a child under the age of 12. The scenic spot has 1-8 meters high staircase, more than 2 meters stair has the handrail. Visitors must be able to climb up the stairs themselves For safety, people who may not be physically capable of completing the hiking required during the tour or pregnant are not allowed to participate. Please pay attention, Lower Antelope Canyon will be closed for the normal cleaning and maintain during the period time of 13th to 26th January, until 27th, it will be reopened. If you have any questions, please contact us. Highly recommended! They have an easy to use website. The time we asked for the visit, we did not have availability and we were immediately sent an email offering, within the same day, other alternatives of available hours. A nice experience. We were asked to be assembled at Ken’s tickets center prior at least 45 minutes because there were really quite more people waiting there of different agencies, and noted that you must pay more cautious waiting in the right queue, if you miss the right time entering according to your designed time, you would not be refunded anymore or changed alternative time to enter in. Incredible natural environment I had never seen before. Strongly recommended I did for the Lower Antelope Canyon, although these both sides of Antelope Canyon are truly amazing for you to see in your lifetime. Great experience I had never ever before. Stunning Antelope Canyon, funny but decent tour guide, and explicit illustration combined this wonderful trip. Highly recommended! We booked the ticket at Wannar.com, really cheaper than other platforms but it did not disappoint our experience any more. Breathtaking views in Lower Antelope Canyon that I thought no other natural attractions I had seen before can compare its beauty. Really AWESOME, really AMAZING! These incredible rocks and ladders made you wonder to know how tiny we are but great of nature it was! One of the most awesome places I have seen and visited, unlikely stunning views to the Grand Canyon, the Lower Antelope Canyon showed more mysterious scenery that you cannot believe such these wonderful places had really existed before you truly seen it by yourself. The price of ticket was reasonable as well. My family also enjoyed this trip either.